"WHERE IS BIN LADEN?" "I'll never talk." "Have it your way. I hear the Knicks are playing tonight." *turns on tv* "NOOOOOO WAIT WAIT." Neither team was an offensive masterpiece. Detroit was the only one to make over 40 percent of their shots, shooting 35-for-83 with 48 of their 96 points coming in the paint. That’s typical of Detroit. Their point distribution graph from last Friday can be found here, but it’s worth noting in this post that they lead the league in the percentage of their points coming around the rim. But the other portion of the paint was a pain. 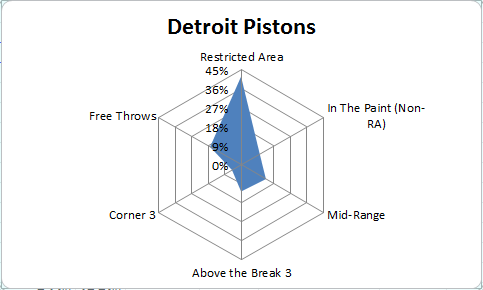 The Pistons score at a bottom-10 rate inside the paint but outside the restricted area, and it only got worse last night when they put up a donut — 0-for-12. It’s the most attempts taken in the non-restricted area portion of the paint without making a single shot. Last night’s looks against the Knicks from that area of the floor were probably what would be expected. Some were altered by Tyson Chandler, others were forced attempts like Kyle Singler slashing after being run off the three-point line, and a few were blown looks by Greg Monroe or Brandon Jennings. It happens, especially when over three-fifths of the Pistons’ attempts come from players anywhere from below-average to awful finishers from that area. It’s also not completely unheard of for a team to go scoreless from there when the league average for attempts per game is about 12.5, nearly half the average from mid-range and around the rim. However, it’s still pretty impressive that Detroit’s 12 attempts resulted in no production. Variance is weird like that. No team has completely ignored the non-restricted area portion of the paint in a game, but there have been games where only one attempt was taken – two of the occurrences coming from the Knicks and one from the Bulls. The Knicks love to shoot outside the paint in general while the Bulls, well, at least Joakim Noah and Taj Gibson, among others, have helped right their ship lately. Houston’s the only team to take less than five mid-range shots, which they’ve done in four games. Moreyball! 11 times has a team not taken a corner three. Detroit isn’t found in any of those games, but four games were from the Pelicans. I guess Anthony Davis can’t do everything. No team has not taken a three from above the break, but Memphis holds the season-low with three attempts on January 31. Around the rim, Sacramento’s the only team to take less than 10 attempts in a game, which they accomplished on January 24 all while nearly toppling the Pacers. That counts for a moral victory, right? Right?! Around the rim is where Detroit thrives. The least amount of attempts they’ve taken within the restricted area is 22, which is Brooklyn’s average per game. They also hold the two season-highs for attempts at 53 and 51 on November 29 and January 10, respectively. It’s that other portion of the paint that’s been tricky for the Pistons, as well as just about everywhere else. Things happen when a team’s composed of players whose ways of scoring overlap with each other’s. Is that not what the Pistons would say to themselves? Long live Caddyshack.